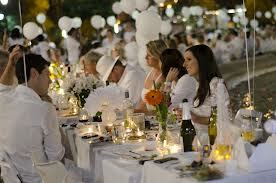 CHIAVARI, Italy – Every summer thousands of people, all dressed in white, gather together for dinner. Not only do they not know each other, but they have to bring their own food, their own tables, chairs and everything else, clean up after themselves as well. 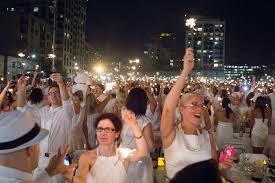 But in spite of all that, the Diner en Blanc has become an international success. It’s easy to see why. Who wouldn’t want to be part of such an elegant soirée that is so beautiful to look at and ever so chic? It all began more than a quarter of a century ago when a group of ten friends came up with an idea to eat dinner in a popular park in Paris. 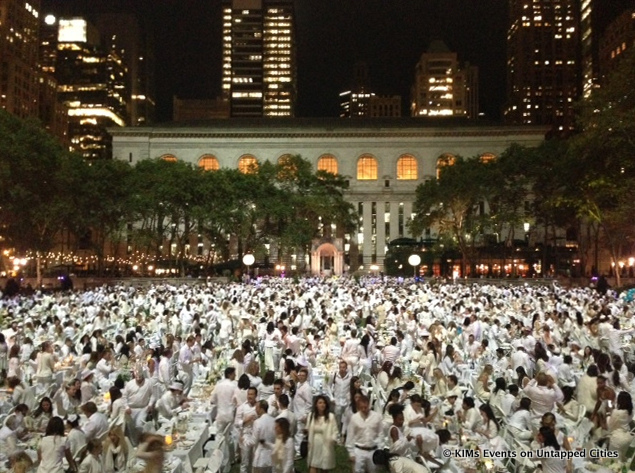 In order to find each other more easily, they decided they would all wear white. 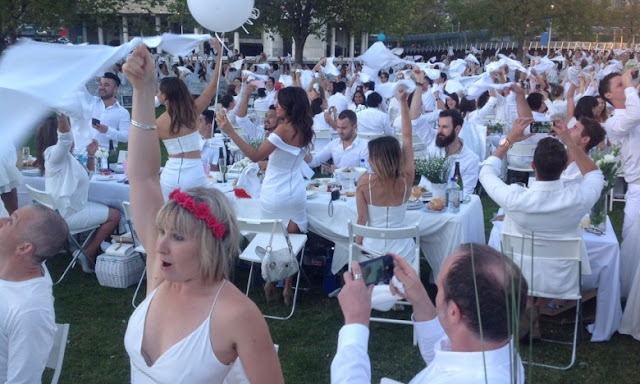 From the original ten the idea grew and the first “open” Diner en Blanc was a gathering of 200 in the Jardins de Bagatelle, the former playground of French royals including Marie Antoinette. What started out as a small, modest affair in 1988 for a group of Parisian gourmands looking to dine out al fresco-style has turned into an international phenomenon, spreading around the globe to cities like New York, Montreal, Vancouver, Los Angeles, Hong Kong, Mumbai and Cape Town. 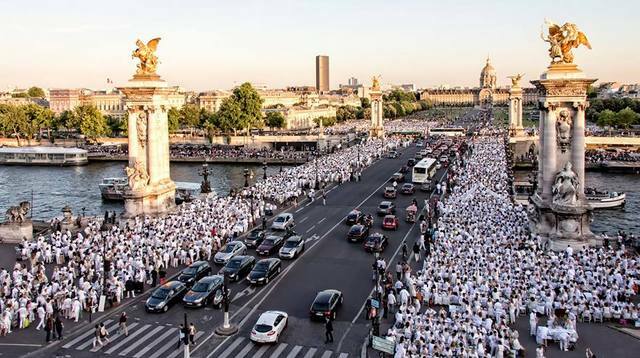 But as the birthplace of Diner en Blanc, an invitation to the flagship event in Paris is the most coveted. This year the 27th edition of White Dinner in Paris took place on a Thursday evening, the 11th of June, in the Palais Royal gardens. Over 10,000 people attended. With impressive military precision, rows of tables were set up, topped with white tablecloths, bouquets of fresh flowers, ornate candelabras and gold-gilded china plates and silverware. Bottles of champagne and white wine were set out, picnic baskets opened and the party began. Local police usually turn a blind eye to this event, in part because of strict rules imposed by the organizers: As quickly as the dinner is set up, guests must also take everything down by midnight and leave no trace of their ever being there – which means taking their garbage and trash with them. But whether you are in Paris or Cape Town the only way to get an invitation is by being invited by a friend or to know someone who knows someone who can get you on the list. But should you break any of the rules, look out! You risk being blacklisted forever. It takes a bit of work to be part of this event. Registration can be a complicated process involving codes, alphabetized name groupings, timed online sessions, and mandatory membership. Guests must register ahead of time and pay a $35 admission fee for the dinner. -The only acceptable color -- be it clothing or table décor -- is white. Foldable tables must be between 28" by 32" (71 cm by 81 cm) and covered with a white tablecloth. Foldable chairs must also be white. .
-At the table men sit on one side, and women sit on the other. Women also have first choice of the best view. -For dinner guests must bring a picnic basket filled with quality foods, preferably white or pale in color – think cold poached salmon or cold chicken – yellow tomato salad or fennel salad, and for dessert how about vanilla parfait or a fancy white cake with white frosting roses. - Plastic cutlery and paper plates are a no no. Only fine china, proper wine glasses and silverware are acceptable. -No beer or hard alcohol like Scotch or Vodka. Only wine and champagne are allowed. -Participants must wear white and be dressed elegantly. You can be as original as you like as long as it is stylish and tasteful. p.s. the "info" web site is valid no matter where you live.